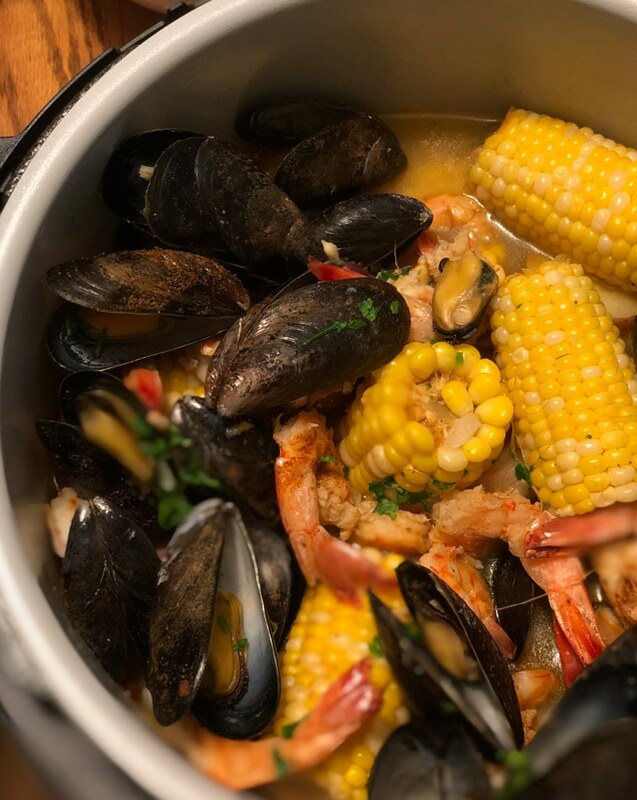 This Shrimp Boil recipe made in the Ninja Foodi is delicious and easy. Now you can have that Cajun style boil in less time and less effort. I’ve been having a ton of fun with my Ninja Foodi. I’ve been making recipes from the cookbook that came with the machine and I’ve also ventured out on my own with these crispy pork carnitas and these chicken wings from frozen. This shrimp boil recipe came about one night when we were simply tired. We had just got home from a Saturday soccer game for my daughter. I wanted something different for dinner. We didn’t want to go to a restuarant. This was the perfect recipe to make. My Ninja Foodi said “use me. ” So I did. 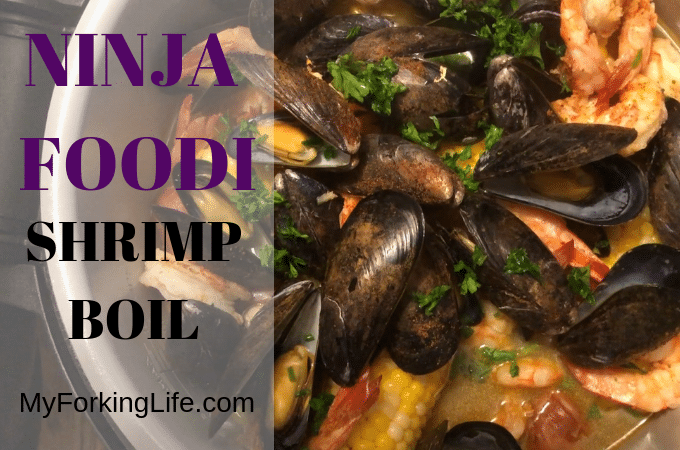 In order to make a Shrimp Boil in the Ninja Foodi, you will want to cook your food in batches. First, you’ll add you andouillee sausage, red potatoes, corn, water, and seasonings and cook on high pressure for 4 minutes, with a quick release. Once your pressure is released, you’ll add your shrimp and mussels, cover and cook on high pressure for 1 minute. Allow your pressure to natural release for 2 minutes and then quick release the remaining pressure. Dip your seafood in prepared garlic butter. Can this be converted to use in other electric pressure cookers? Yes! 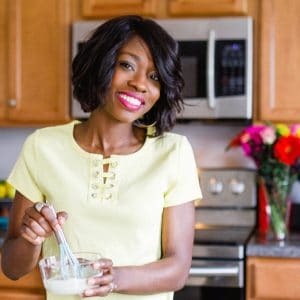 I only used the pressure cook function for this recipe so you could use other electric pressure cookers for this recipe as well. Looking for more Shrimp recipes? Try my Pressure Cooker Shrimp Paella. 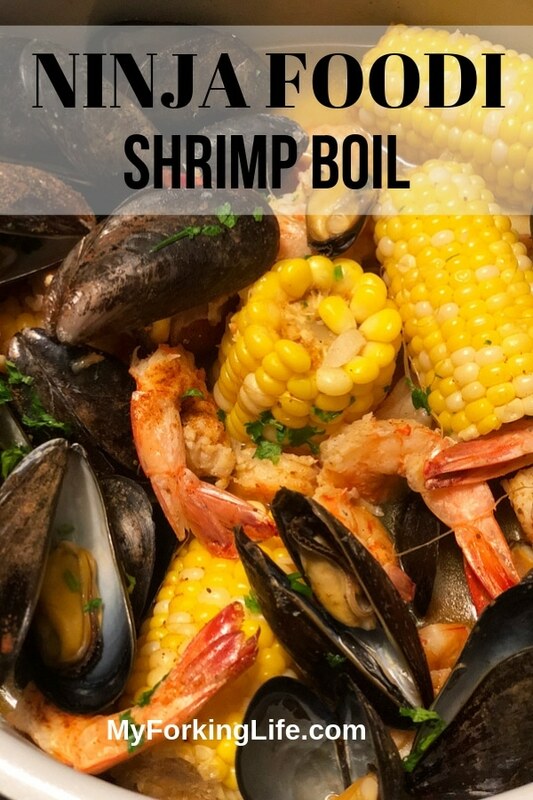 Easy and tasty shrimp boil made in your Ninja Foodi pressure cooker. Add red potatoes, corn, sausage, water, shrimp boil liquid, and 2 tsp old bay to the Ninja Foodi insert and stir. Cover and cook on high pressure for 4 minutes. Once timer is complete, do a quick release and open lid once all pressure is released. 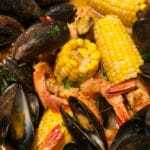 Add shrimp and mussels and 1 tsp of old bay. Stir. Cover and cook on high pressure for 1 minute. Once timer goes off, allow to natural release for 2 minutes, then quick release remaining pressure. Combine butter and garlic powder in a separate bowl and use as a dipping sauce. This recipe was prepared in a 6.5 Qt Ninja Foodi. Can you add lobster to this recipe and if so how long do you suggest I pressure cook it for? Hi Patty, the time I added lobster tails to this recipe I cooked it separatley. However, if you are going to add tails, I’dd add them in the initial cooking cycle of 4 minutes. What a sweet recipe. I’m going to add some crawfish to the mix and make black garlic butter for my dipping sauce. I have the Zataran boil in bags and it will be my first attempt at this wonderful dish.